I’ve always been rather sceptical of zoos. I mean, surely no matter how good it is, the poor animals are confined in spaces much smaller than their natural environments and are stared at all day, every day by hoards of gormless faces. However, on researching ‘Things to Do’ at the start of our Big Adventure, Zurich Zoo was at the top of my list. So, on my 38th birthday off we set on a “fine and fancy ramble to the zoo” (sorry, but how can I pass the opportunity to include some Simon and Garfunkle lyrics?!). Zurich Zoo is on the north east side of the city and after our 30 minute car journey, and a short preview of one of the “world’s most liveable cities”, we arrived. With it being a Saturday we were expecting the place to be packed but were pleasantly surprised as we only had to queue for 10 minutes before gaining entry and once inside the crowds rapidly thinned along the different paths snaking all over the zoo. Not sure who’s more excited – think it’s the penguin! Our first stop was the “Exotarium” (or Reptile House). Admittedly, this was not high on our priority list but was a good way of getting into the zoo vibe with some great games of ‘spot the frog’ before being greeted by a rather fine set of crocodile gnashers and rather too many snakes for my liking. Urg, makes me shiver just thinking about them, so we’ll quickly move on! Zurich Zoo is home to over 340 different species of animal and, like most zoos these days, has an active breeding programme. I was keen to get over to the newly built Elephant Park and the celebrated elephant family that resided there. However, it took us a good hour and a half to get there, as along every path and round every corner was another animal to spot, learn about and (sometimes) laugh at. Joshua became rather obsessed with the camels and their talent for going without water for up to 6 months and consequently not going wee for long periods of time. Thankfully he hasn’t tried this out himself! The copulating baboons caused another diversion by the children questioning the game they were playing and that it should be the big monkey giving the little monkey a piggy back, not the other way round. Finally though we did arrive at the Elephant Park. The Zurich Elephant Park is quite some feat and certainly challenges perceptions that zoos are purely places that cage animals in alien environments for human entertainment. The park cost 57 million Swiss francs to build and features 6 water basins for the elephants to swim in, one of which is a glass aquarium that allows visitors to watch these amazing creatures swim, set in a total area of 11,000 square metres. Clearly the animals are happy in their environment as in late June this year a calf was born and named Omysha which means ‘smile’. 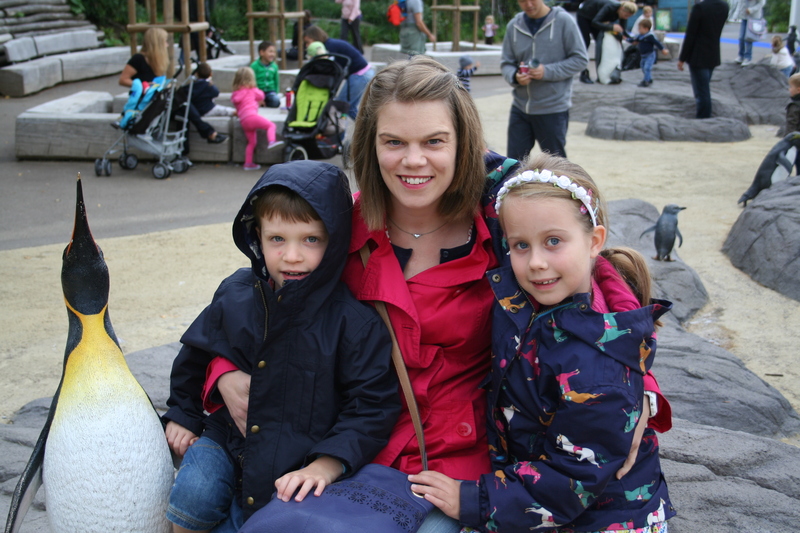 There were plenty of smiles as the elephant family roamed happily around the park. Omysha stuck close to her mummy and it was fabulous to see these giants being so gentle and tender, their velvety trunks with seemingly a life of their own. On going into the Thai house we were met with the sight of an older elephant who simply amazed me. He looked wizened and aged but his eyes seemed to carry the knowledge of the world in them. A truly awesome animal and one that I wish had been able to talk! Unfortunately the elephants weren’t in the mood for swimming – think it was too close to lunchtime – and so we didn’t get to see these incredible hulks floating weightlessly in the water, something for another time. Watching animals is hungry work and, following our noses we managed to secure a couple of plates of sweet and sour chicken with rice just round the corner from the elephant house, freshly prepared in a tiny Thai hut and served on a bamboo plate. Priced at 16CHF per plate, and with 2 plates being enough for the four of us to share, it worked out as a very tasty and reasonably priced meal out. After lunch it was time to get back on the animal trail, working our way round a new construction site (which promises a Mongolian Steppe complete with a Yurt village and camel rides in 2015) to the big cats. The lions were asleep – the King of animals secure in their status and not feeling the need to perform for the crowds. However a word to the lions, there may be the rumblings of a rebellion, the tigers could be about to overthrow them. The Tiger was an absolutely beautiful creature. The markings over its body combining practical camouflage with beauty. The paws, the size of dinner plates and their murderous weaponry disguised by shaggy fur that you just want to reach out and touch. Then the face, just a gorgeous mass of fluffy fur, delicate markings running from the eyes and mouth. Oh, yes, the mouth. Teeth pointed and needle sharp and gently tearing apart a rack of ribs hanging from a crane into the enclosure. The power and beauty hiding the vicious animal within was quite breathtaking and something that none of us wanted to leave. Onwards, past the beautiful, but injured, snow leopard. Past the baby bear that was cavorting with its mummy, as daddy kept its distance. Past the rhinoceros that was pacing up and down like some expectant father. Into the monkey house with the fascinating gorillas and orangutangs. Disconcerting how you see yourself reflected in their eyes and their movements, the intelligence that matches ours, along with the bemused expressions of tenderness when dealing with their young. All so familiar. Still on we went. On past the owls (Hedwig was definitely away from Hogwarts that day), past the giant tortoise, past the llama cheekily playing peekaboo over the wall, and on past the flying rainbows of the parrots. Finally we were done. We had walked for hours, arriving at 10am and it was now 3.30pm. There hadn’t been a single “I’m bored” or “When are we going?” from either the children or adults and whilst we were ready to sit and have a cup of tea (which was terrible by the way, but then I guess we aren’t in England anymore Toto! ), we weren’t quite ready to take our leave of this wonderful place. So, the children played among giant toadstools, slides and swings, whilst Steve and I reflected on our trip. We had all had a fantastic day and with entry costing just 65CHF (under 6s are free) it had been the most reasonably priced activity we had done so far. A great birthday treat. And for the zoo sceptics among you (like me) Zurich Zoo has managed to create fantastic ‘real-life’ enclosures that allow the animals to live in an environment as close to their natural habitat as possible. There is lots of space in the enclosures and a great balance between getting up close and personal with the animals and keeping both the animal and visitor safe. It didn’t feel like a zoo, it felt more like a wildlife park with animals that are looked after and nurtured to safeguard the survival of their species. It was only when we got back to the car that we realised we had forgotten all about the Madagascan Rainforest. Oh, well, I guess that will mean another trip. Anyone want to join us? All opinions given in this article are mine, I received no money in exchange for this review. Prices are correct as at August 2014.